Cold feet are now a thing of the past, thanks to the Boot Suits™. Never before has hunting been made more enjoyable than with the Boot Suits. 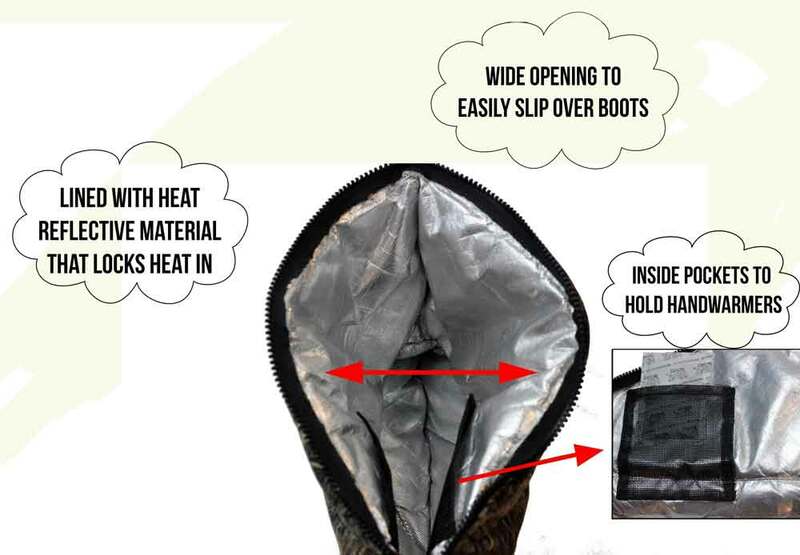 Our insulated boot covers,are designed to eliminate cold feet. 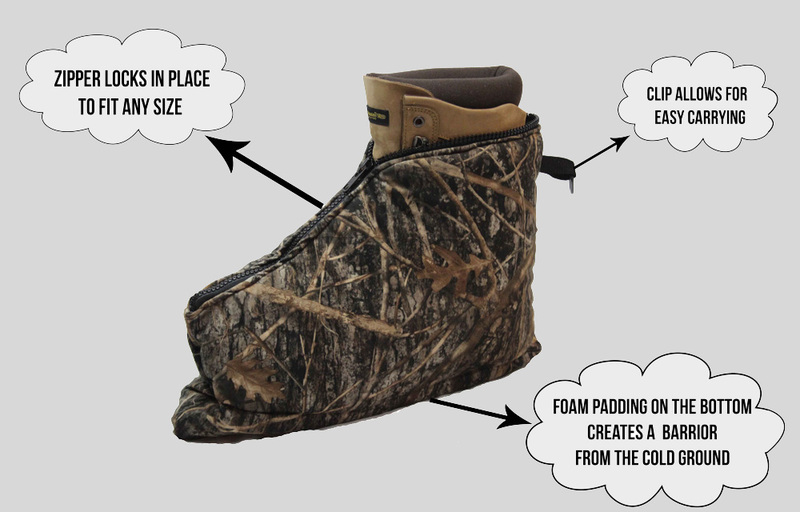 The boot insulators are packed with essential features to keep your feet warm all day long. The Boot Suits™ unique, fold flat design, makes them easy to transport and store, it also makes them easily to put on, even with heavy hunting cloths on. The inside fabric is a special heat reflective material, combined with the 1” thick insulation, keeping the feet warm just became easier. Not made for hiking, these are meant to be used for stationary sitting only. One size fits most. Please visit or Q&A for more information. Rimlo Products LLC is a small company located in Wisconsin. We are deer hunters that love to hunt, and enjoy spending time in the woods. Our mission, is to provide equipment that can be used to make the hunter’s experience in the woods one that is comfortable and memorable in a good way. Our Boot Suits line www.bootsuits.com is specifically designed to help keep the hunters feet warm. Cold feet is the number one reason deer hunters are unable to sit for as long as they desire to in cold weather. Our other product line is the Slumper Hunting seats www.slumperseats.com . These are universal fitting replacement tree stand seats, and also hunting cushions used in a variety of hunting situations. 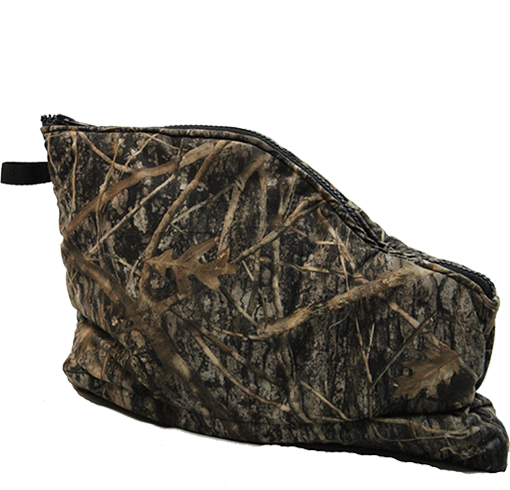 They have cushions designed to make your hunt as comfortable as possible. Our moto is “ Stay the Day “ which we hope our products will enable you to do. 1. Why are the Boot Suits™ shaped like it is? The Boot suits™ are designed with several key factors, these help make sure they keep your feet warm, and are easy to use. By using this design, you can easily step your foot into bag. This design also makes putting them on with all your hunting clothes much easier. Also with this design, it makes an air chamber. Dead Air is by far one of the best insulators you can have. These aren’t for a fashion statement, they’re for keeping your feet warm. 2. What Size do the Boot Suits™ fit? The inside opening is 16”. Boot sizes from 6-13 are ideal but can also fit boots up to 15” long. 3. But I have small feet, now what? It’s OK- The more air, the better the insulating factor. With the zipper design on top, simply zip it tight up to your leg, and the boot suit™ will become locked to your foot. Remember these are for sitting and standing in one spot, they are not for walking around in. 4. When should I put the Boot Suits™ on? Immediately upon getting to your stand is best. These do not make heat, they contain it. So if you wait till your feet are cold already, then put them on, it’s probably too late. There are also hand warmer holders located inside the Boot Suits ™. Simply stick one hand warmer in each holder. This can help in keeping your feet warm in really cold conditions. Make sure to knock off as much snow that may be on your boots as possible, otherwise you just turned them into coolers. And remember these are not designed to walk in. 5. Can the Boot Suits™ get wet ? Yes, but don’t forget to dry them out. The inside reflective material is water proof, and the outside is water resistant. The insulation we use is also water proof, but can remain damp if not left to dry. 6. Are the Boot Suits™ quiet? Very, we specifically used these materials, which makes them super quiet, we hunt, and we know what kind of hearing a deer has. Go ahead, rub your feet together like a cricket! The Boot Suits™ have a 90 day replacement guarantee. If your Boot Suit™ fails due to craftsmanship and not show signs of misuse, we will happily replace them. Make sure to keep your receipt or order number. Remember, these are not made to walk in, standing in dirt and walking a couple feet around stand area will not show severe wear on sides or even bottoms.